"Hidden Gem: LKN Antique Mall"
Hi all! It's be a minute since I posted an entry, but I'm back. I actually just returned from a whirlwind trip home and I'm looking forward to kicking off my birthday week today. Let the celebrations begin!! 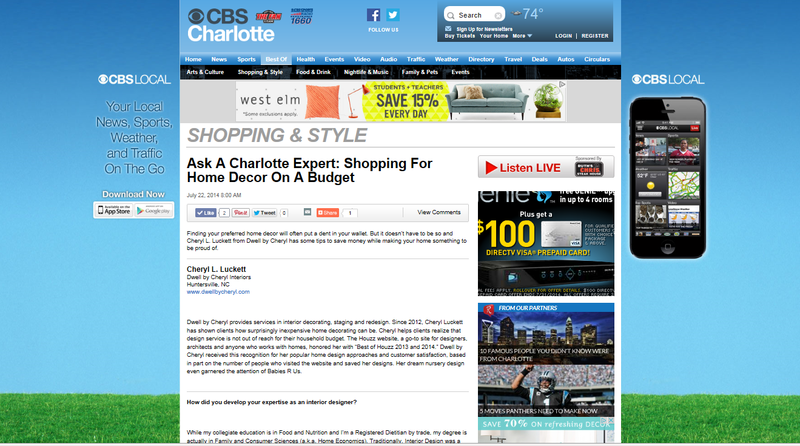 Speaking of celebrating, it was pretty cool to come home to a feature article on the CBS Charlotte website's Ask a Charlotte Expert column. About a month or so ago, I received a request for an interview where I would share my tips for decorating on a budget. Well, that story ran yesterday. Yay! You can read the entire article HERE. It also ran on the WPEG Power 98 website in the Best of Charlotte section. You won't want to miss my no fail, inexpensive ways to update your home. Leave me a comment there and be sure to share the post on social media.